A little rain – at some moments, actually, a lot of rain – didn’t keep paddlers or spectators away from Baltimore’s Inner Harbor Sept. 8, for Catholic Charities of Baltimore’s’ 11th Biennial Dragon Boat Races. 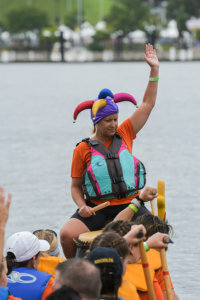 More than 600 paddlers representing 28 teams from local businesses and nonprofits came together to compete for bragging rights and raise funds for a long list of Catholic Charities programs that benefit children and families, seniors, the homeless, immigrants and people with intellectual disabilities. 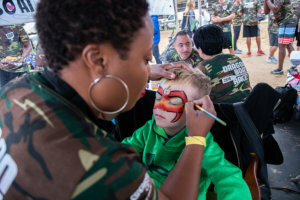 The organization estimates a total of $750,000 will be raised from this year’s event. 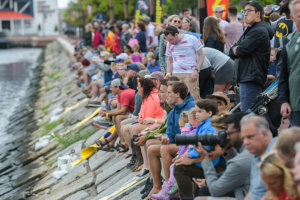 The teams, each made up of 20 paddlers, a drummer and a steerer, raced in 41-foot canoes, carved and brightly painted, replicating Chinese dragon boats. The 1,290-foot course ran from the World Trade Center, on the north side of the Inner Harbor, to the Maryland Science Center on the south shore. Each team was partnered with a Catholic Charities program. Brown Advisory, which last won the Dragon Cup in 2010, competed for the Esperanza Center, an immigrant resource center that offers hope and essential services to people who are new to the United States. Brown has raised approximately $40,000 for the center this year alone, support that is particularly vital, as the Esperanza Center was temporarily closed by a fire in Fells Point Sept. 7. Christian Ventimiglia is a portfolio analyst and Dragon Boat team captain for Brown Advisory. Brown Advisory came in first place in the Financial Services Team Challenge. Johns Hopkins Health Care “Grateful Bread” filled two teams for the first time, both supporting Our Daily Bread, where its employees volunteer throughout the year. In order to fill two boats, Chase wrangled 44 staff members – including President Patty Brown, COO Karen Eskridge and Chief of Staff Vicki Fretwell – to practice once a week for eight weeks. Coincidentally, Our Daily Bread volunteer manager Nick Rudomin said that 45 volunteers are needed daily to help run the organization. “We won’t survive without our volunteers,” he said. Between races, paddlers rested at the tent village set up on Rash Field, which was enlivened by tent “judging” and team chants, won, respectively, by Catholic Relief Services and Harkins Builders Inc. All ages came out to support family, friends and colleagues, wearing their team colors with pride along the promenade. Beth Nolan brought her daughter, Katherine, and some second-grade classmates from St. John the Evangelist School in Severna Park, all decked out in their school t-shirts, to see their teacher, Helen Hesenperger, work an oar. St. John was racing for the DePaul House – Senior Living. More than 100 of the school’s students took to the stage and performed a special song and cheer to support their team. 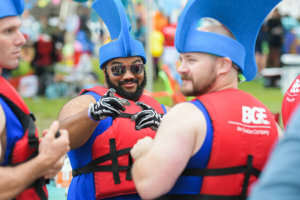 Alvin Chesnavage, principal business analyst at BGE, is the longest-running paddler in the history of the Catholic Charities event, on its team since the race’s inception in 1998. BGE partnered with My Sister’s Place, where staff volunteer at the shelter on a regular basis, serving breakfast and lunch and helping clients with their resumes and job searches. Chesnavage, who grew up in the Sacred Heart of Mary Parish in Graceland Park with 11 brothers and sisters and now lives in Pennsylvania, said he was raised to always help the less fortunate. “For me, personally, it is such a tremendous feeling to know we are making a difference,” he said. Bill McCarthy, Catholic Charities Executive Director, echoed that sentiment. Lisa Harlow is a freelance writer for the Catholic Review. A Baltimore native, Lisa has more than 20 years of experience in journalism and public relations and has been honored by the Maryland Delaware D.C. Press Association and the Public Relations Society of America. Lisa is graduate of The Catholic High School of Baltimore. She holds a master's degree in professional writing from Towson University, and she is a parishioner of Our Lady of Mount Carmel in Essex, where her son attends school.